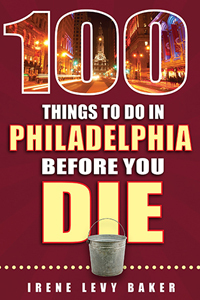 Now, Irene Levy Baker joins us with an eye on touring more of Philly’s historic sites in her book, 100 Things to Do in Philadelphia Before You Die . And if you purchase your copy through 100ThingsToDoInPhiladelphia.com and mention you heard Irene on The History Author Show, Irene will sign your copy. It makes a great gift! You can also find Irene @100Philly on Twitter, and Facebook.com/100ThingsToDoInPhiladelphia.